ALL THAT GLITTERS. 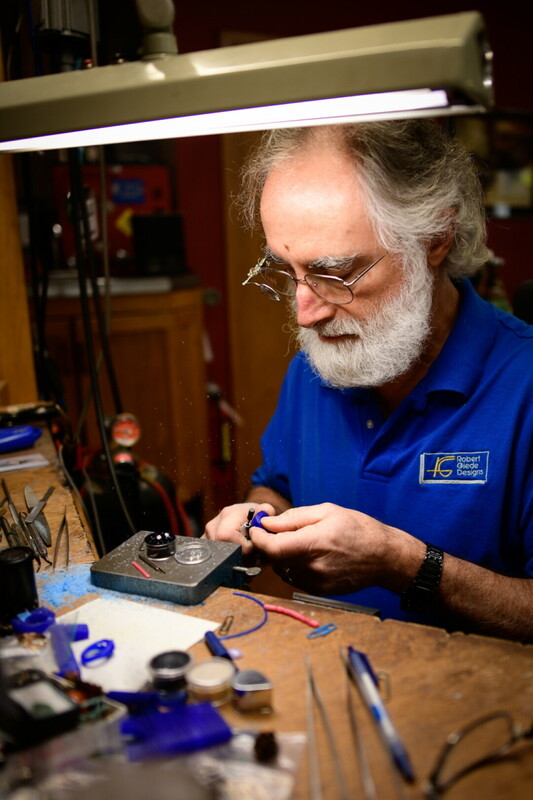 Menomonie’s Robert Giede has been handcrafting fine jewelry for over four decades. Besides traditional gemstones, Giede works with elk ivory, spent bullets, and much more. Robert Giede wears two rings when he isn’t at his work bench. On his right hand ring finger is a rust-red and orange fire agate nearly the size of his fingernail, mounted adjacent to a small white diamond on a yellow gold band. His wedding ring, on the other hand, sports four diamonds – teal, white, grass green, and olive – floating in the eddy pattern of a thick band of the same yellow gold. Both are of his own making, pieces he has crafted in his more than 40 years of jewelry making in Menomonie. “I’ll never forget an article in one of my trades magazines years ago,” Giede, of Robert Giede Design on 2321 Broadway St. S, said. It claimed that a little bit of jewelry shows that a person, especially one in the job market, is talented enough at what they do to earn a good living. Too much jewelry, in contrast, might send a signal of extravagance. “I’ve never forgotten it. 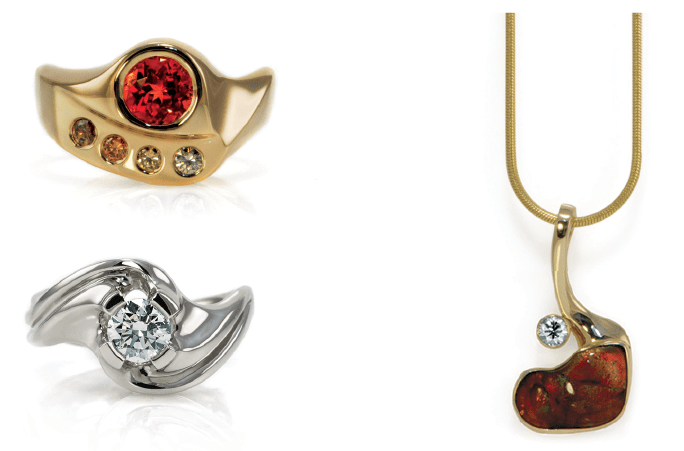 Jewelry isn’t just to adorn. It’s also a sign that you know what you’re doing.” Then he chuckled and looked at his hands. “And here I am without my rings!” He went to retrieve them. It’s a look that’s influenced by Giede’s prioritization of durability and by a talent for balancing function with form. Wide bands and bezel settings provide comfort, resist catching and wear, and hold gemstones snug and safe. These values inform the finished works, which are unapologetically bold and strong. Giede arrived at UW-Stout in 1970 from Park Falls, Wisconsin, where he had worked in high school as a mechanic. He began his studies in industrial arts, with the purpose of becoming a vocational educator. However, the coursework bored him. He knew to get off the educational path when he taught a small engines class and noticed that only a handful of students were actually paying attention – it wasn’t for him. A summer job as a mechanic in Canada turned into a year-and-a-half long break from university. 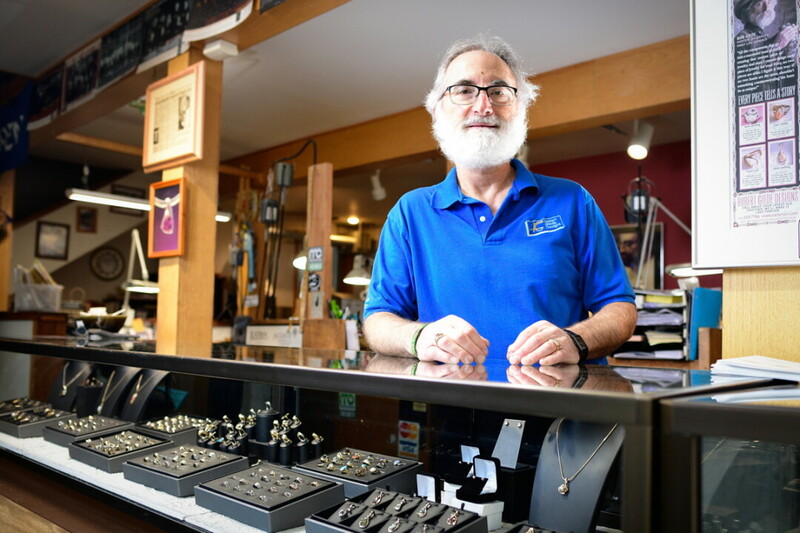 When he returned, he took a metalsmithing class on a whim, and in 1976 he left school again and opened his first storefront on Broadway St. in Menomonie. In addition to carefully selected traditional gemstones, Giede creates settings for elk ivory, spent bullets, cartridges, and other tokens from the hunting experience. Hunters can bring in mementoes to be the centerpieces of designs for jewelry, cufflinks, belt buckles, and more. Giede is a sportsman himself. His father taught him and his brothers to hunt and fish. In his lifetime, he has hunted deer, elk, moose, antelope, and more, venturing to Montana and even Alaska for the experience. He loves the sportsmanship and the community of hunting, the sharing of excess. Giede recalls hunting with friends in Alaska; when the group harvested three moose, they had enough to feed several families and give meat to their friends. Giede shares his own excess through donations to charitable causes within and outside of the Valley. He has lent support to health causes including the Free Clinic of the Greater Menomonie Area and Ovarian Cancer Symptom Awareness, and to several conservation groups as a manifestation of his love for the outdoors. “I’ve done a lot of my friends’ wedding sets, and now their children’s’ wedding sets,” Giede said. There’s a lot of job satisfaction in creating each piece.” He pulled out a calculator to estimate how many items he’s made during his career. At about 200 pieces each year, for he (very conservatively) offers, 25 years, there would be nearly 5,000 works floating around with the Robert Giede Designs stamp. Out of those thousands, two rings hold a place of honor in a front-facing case in Giede’s shop. One, a yellow gold band with a fire agate. The other, agate in silver. Both were the first ring he had made using the metal, and both had gone out into the world and deigned to return themselves to him. The silver ring he gave as a birthday gift to a friend, upon whose death it was found in a drawer and returned to Giede by the man’s family. The gold, purchased as a gift for a woman for Christmas 30 years ago, was the wrong size for its recipient and subsequently returned. Five years later, it was purchased a second time as a Christmas gift. This time, the recipient wanted an additional stone, so she exchanged it for a custom design. “So I said to myself, this was the first gold ring I ever made – I made it in ‘75 – so it’s not for sale anymore,” Giede said. For the most part, however, Giede’s customers come to him to get unique designs. “People want something different,” he said. “And they want something well-made.” Giede has always wanted to be the best at what he does, to be fair, and to have fun, and his reputation for doing so for more than 40 years continues to bring in generations of jewelry-lovers.